The Oxford world’s classic edition of Pushkin Stories assembles in one volume the famous short stories “The Queen of Spades”, the “Tales of the Late Ivan Petrovich Belkin”, “Peter the Great’s Blackamoor” and the historical short novel “The captain’s daughter”. I restricted my reading to the two best known stories: The captain’s daughter and the Queen of spades. While united between the same covers, both stories could not be more different, as if written by a different man. In the spooky yarn “The Queen of Spades”,, the author is full of confidence, self-assured, master of his Art. In “The captain’s daughter”, written later, the author leaves us with a salmagundi of different genres and we feel that something else is going on. It is as if Pushkin is pondering which way to lead his art and how to escape the restrictions both real and artistic, which have been forced upon him. The story narrated in “The captain’s daughter” is the story of Pyotr Andreyich Grinyov. In fact, we are reading his memoir. Grinyov is the child of a retired army officer and is bred to thread in his father’s steps. When he is seventeen, he is sent to the far city of Orenburg to do his military service. En route, Grinyov does things his own way and is an easy prey for gamblers and drunks. His man-servant unsuccessfully tries to intervene, when he sees his young master Pyotr squandering the money his father gave him for the long trip. During a fierce blizzard Grinyov goes even so far as to give away his hare skin jacket, in true Saint Martin fashion, to a mysterious man they bump into and who is dying of cold. Still, after a few more incidents, which emphasize the young man’s initial “naïveté”, Grinyov arrives at Orenburg. He is assigned to the Belogorsky fortress which is under the command of captain Ivan Mironov. Arriving at the fort, which is nothing more than a wooden enclosure build around a lousy village, Grinyov is introduced to the captain, his bossy wife Vasilisa and their daughter Masha. They are niece people and Pyotr is soon a regular guest at their table. Grinyov meets also a fellow officer, Shvabrin, who is send to this outback on account of a fatal duel. Both young officers fall in love with the only available young woman and soon enough they stand face to face to decide things with a duel. Grinyov is wounded and the duel remains undecided. Masha from her side has eyes only for Grinyov and this encourages the young man to write his father to ask a blessing for their marriage. But the father finds his son too young and refuses the blessing. A few days later, the fort is attacked by a wild bunch of renegade Cossacks, led by the historical rebel Pugachev. After a few skirmishes, the fort is easily taken by the Cossacks. All military and civilian are forced to swear allegiance to Pugachev. Only Mironov and Grinyov refuse. The old Captain is the first one to be executed. His wife is killed as she tries to intervene and protect her husband. Then it is the turn of Grinyov. But Pugachev, who appears to be the man who was saved by Grinyov, during the snowstorm, recognizes the young man and sets him free. The other officer, Shvabrin, joins the rebels to save his life. Masha is able to hide somewhere within the fort. Later at night, Pugachev and Grinyov have a private discussion over dinner. 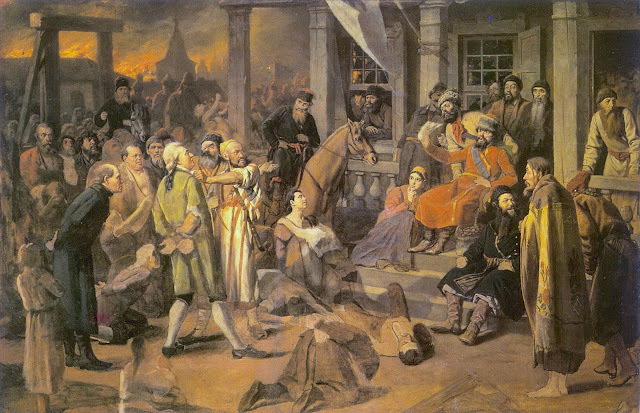 The young officer still refuses the offer to join the rebels and Pugachev decides to send him back to the city of Orenburg, carrying a message to the Governor to announce that the rebels will now march on the city. Grinyov is not expected to come back. Pugachev considers his debt to be paid back. Grinyov leaves the city with a heavy heart. He and Masha ( who is still hiding in the fort ) are in love and the young man hates to leave his beloved behind, especially when Pugachev appoints Shvabrin as new commander of the fort. Shvabrin has noticed the disappearance of the girl and is trying o find her. “The Captain’s daughter” appeared in the November 1836 issue of the literary journal Sovremennik, only two months before Pushkin was killed by that rascal ( may his name be triply cursed ) Georges d’ Anthès. This means that although, the elaboration and the first drafts of the novel were already written as from 1833, the final version of the book was penned down in that year ’36, the year that saw the tragic build up of the tensions which would culminate in the fatal duel. While it was the unfaithfulness of his wife which tilted the writer over the edge, other frustrations had strongly fuelled his anger. Pushkin did not do well anymore commercially speaking and his financial situation got the worse for it. Things were so bad, that he even had to sell Mikhailaovskoe, the beloved rural estate of his mother. On top of that there was the younger breed of writers yapping at his heels. They still treated Pushkin, now 37 years old, with due respect, true, but the mere fact that they were recognized as the younger generation implied that he could be considered “passé”. The critic Belinsky had already warned his readers that Pushkin’s prose was a sure sign of the writer’s decline. Torn between the necessity to write a commercial success and the aspiration to remain a literary innovator at the Artistic forefront, Pushkin still believed he needed another masterpiece to seal his reputation and silence his critics. Last but not least, Pushkin was immensely frustrated with his relation with the St Petersburg court and the Tsar in particular. Nicholas I, prudent with unruly intellectuals since the Decembrist uprising, kept a close eye on the writer. In fact by keeping the writer close to court, Tsar Nicholas had the writer on an administrative leach, even going so far as to be himself the very personal censor of Pushkin’s new works. That the writer’s beautiful wife was also close at hand was a bonus, gossips add. Pushkin, with a wife and four children depending on him, was well aware that he was locked up in the golden cage. In this oppressive, even claustrophobic atmosphere, we can imagine that the writer was captivated by the forgotten revolutionary “hero” Pugachev and the “Sturm und Drang” dynamics of his rebellion. Pugachev was rather unknown with the larger Russian public, because after his execution his name and memory had officially been banned. He was a disaffected ex-lieutenant of the Imperial army, who in the year 1773 and 1774, during the largest peasant revolt of Russia’s history, took the lead of an insurrection of a Cossack faction, at the moment the unrest swept trough south and central Russia as a wildfire. Emboldened by his first success, Pugachev even formed an alternative government to challenge the imperial administration of Catherine II. However once the Imperial army recovered from her surprise, the rebellion was knocked down and Pugachev captured and executed in January 1775. Pushkin immediately saw the possibilities to use the Pugachev rebellion as the backdrop for a new fictional story, but while working himself trough an enormous pile of documentation, he decided to switch to a non – fiction rendering of this history. He submitted his idea to the Tsar, who agreed that the writer could proceed. Under close scrutiny of the Tsar, Pushkin thoroughly studied the court’s archives and documents related to that uprising. He even travelled to Kazan in 1833 in order to meet possible witnesses and to get an idea of the scenery. Pushkin’s historical book turned into a behemoth: 1100 pages collected in two folio volumes! Pushkin had been very careful in what he said and how he said it; the Tsar ordered only a handful of minor changes. The title however had to be changed from “The history of Pugachev” to “The history of the Pugachev rebellion”. A criminal should not be honored by having a book named after him. Unfortunately despite all the work Pushkin put into his historical non fictional work, it was not successful. It seems that Pushkin was not happy with the result either. Especially the figure of Pugachev, whom he had described and depicted very carefully, anticipating a reaction from the Tsar against a too humanly or sympathetic bringing of the rebel, was unsatisfying. This character deserved better and Pushkin decided to have a second go at it but this time in a fictional way. We can only guess of course, but there is a suspicion that in the fictional rendering of the same occurrences, Pushkin wanted to add flesh and blood to the character he seemed to admire. The result is evident. While Pugachev in the historical narration remains a two – dimensional character, in the “Captain’s daughter” the fictional Pugachev becomes a man described with all his strengths and weaknesses, his mercilessness and his grandeur, his cruelty and his bravery. Pushkin, aware of the thin ice he moved on by rendering the man, who dared to challenge the established law and order, more sympathetic, took the necessary precautions. He made sure that his novel would be perceived as a fictional story, a journal or a memoir by a potentially unreliable narrator, recounting occurrences obscured by the distance of half a century. Pushkin already incorporated different elements into the book, in preparation of a refutation of the possible critics who, he suspected, would accuse him immediately of trying to whitewash the Cossack rebel. Still one cannot but observe the human traits, Pushkin adorns the rebel with: comprehension, indulgence, humor, compassion and honor. Clearly the writer sympathizes with the rebel. Maybe he envied him. The composition of the “Captain’s daughter” took place in the early 19th century. It was a time of political turmoil throughout Europe, with an Aristocracy and a Clergy fighting for survival. Curiously, Pushkin hidden rebellion is noticeable in his writing too. It finds its expression first of all in the choice for the novel, that formless vehicle, as the medium to convey his new story. In that time, the novel was still pretending to be something else: a journal, a diary, a letter and writers still were uneasy with the artistic authority bequeathed to them. But, rather than trying to shake of the dominion of genre and style, Pushkin in his novel creates a hodgepodge of genres. Refuting the choice to compulsively follow or stick to a genre, he explores and uses the different genres: the story kicks off as a “Coming of age” novel, with a young man entering a world of challenges and education. It gets an air of a historical novel, à la Walter Scott, doubling as a biographical novel, then it becomes a Romance and finishes in a way of a fairy tale, with a gentle old woman, to whom the captain’ daughter opens her heart, transforming herself into the Good Tsarina who with one tip of her magical baton, punishes the bad ones and rewards the good and honorable victims. It is as if he wants to say: “Look, I can do it anyway I want it. I am free to develop my story however I want”. Subversive is what comes to mind, when we see how Pushkin rejects all fixed points of view, how he is both Romantic and not Romantic, classicist and non classicist, realist and non realist. The Death of Pushkin was a disaster. We will never know what other great masterpieces where going to flow out of his genius pen. The confusion of genres, the sense of rebellion we like to imagine in the “Captain’s daughter”, was it a preparation of greater things? Did Pushkin knew what was next? Did he instinctively imagine it? We will never know. In any case the narration can be seen as a demonstration of his versatility, the chaotic sound of an orchestra tuning it’s instruments, nothing less than a stretching and warming up for better things to come. This hodgepotch of styles gives the story an eerie edge, a kind of a freeze-frame within a movement towards a Modernism “avant la letter”. As Andrew Kahn boldly concludes, the story of the “Captain’s daughter” leads not towards Dostoyevsky or Tolstoy, but much further, to the 20th century writers, it is a shortcut to Zoshchenko or even to the Nabokov of “Pale Fire”! But this review should not lead us too far astray. Both “Queen of Spades” and the “Captain’s daughter” are simply very entertaining stories which gave me much pleasure and the occasional laugh. And let’s not worry too much about Pushkin either. His legacy shines bright enough. It shines from a time when artists like Pushkin were not free yet, who were not enfranchised yet, but whose talent was so vibrant, that despite everything, nearly 200 years later we still feel the vibes.